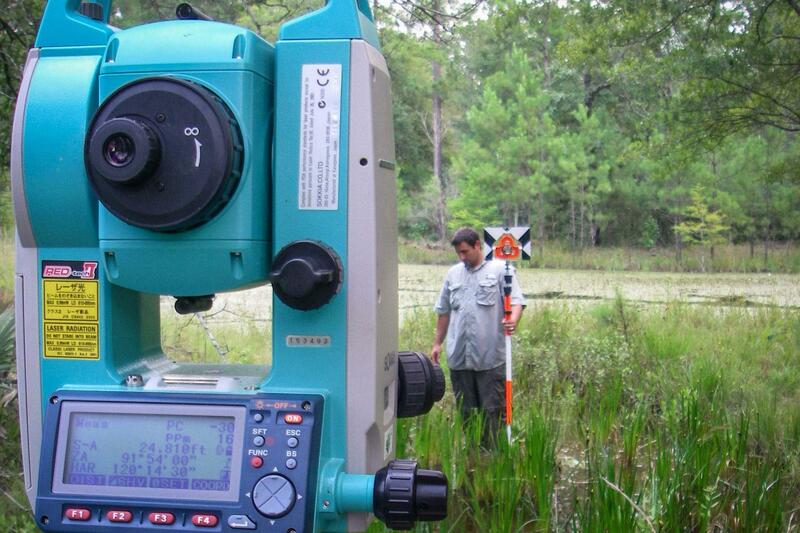 Conduct a detailed assessment of the topography associated with portions of Greens Bayou Wetlands Mitigation Bank Sub A-1 parcel. These data will then be used as input for a GIS-based water model that predicts surface coverage of submerged areas and development of a hydrological modeling tool using a GIS based approach to predict the extent of submerged land, associated water depths, and potential surface water flow paths. The Harris County Flood Control District's Greens Bayou Wetlands Mitigation Bank is a 1,400-acre wetland project in northeast Harris County, Texas, located immediately south of Beltway 8 and east of the confluence of Greens and Garners Bayou (HCFCD 2006). The site contains a diverse mixture of pine/hardwood forests and open grassy prairies, interspersed with wetlands that exist in a system of old meanders and large depressions. The goal of this long-term mitigation bank project is to create a large, continuous area of protected wetland habitats by enhancing existing wetlands, while also creating new wetlands from upland areas. In order to better understand and predict hydrological processes and conditions at the Subdivision A Phase 1 site it is necessary to gain additional information on the fine scale topography of existing ponds and swales. The increased resolution of the site topography and the enhanced GIS data of Subdivision A Phase 1 will allow HCFCD to conduct more sophisticated watershed modeling of the property in the future. The technology and methods used in this project can be used as a template for future evaluations of the proposed expansion of Subdivision A Phase 1. This will ultimately enhance the ability of HCFCD to manage the property more efficiently. We proposed a three-year project composed of three phases. Phases 1 and 2 involve primarily field data collection in support of Phase 3. The final overall objective will involve completion of tasks during Phase 3. This will involve the development of a hydrological modeling tool using a GIS based approach to predict the extent of submerged land, associated water depths, and potential surface water flow paths. This model could be used in a predictive fashion to estimate the response of the wetland to varying meteorology. The data could also be used to develop a predictive model that estimates the extent of submerged lands based on automated water level monitoring data. HCFCD and other GIS users would be able to use this tool in the future as a predictive tool for management and education. 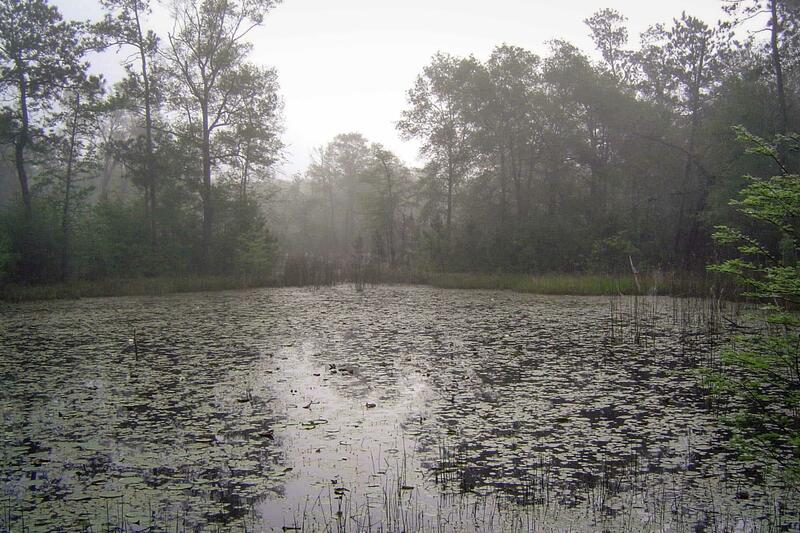 During phase 1 of the project, our primary objective was to conduct a detailed assessment of the topography associated with portions of the Greens Bayou Wetlands Mitigation Bank Subdivision A Phase 1 during 2007. Phase 1 tasks primarily involved collection of detailed topographic data for use in a GIS based water model that predicts surface coverage of submerged areas. The primary objective was to determine the spatial extent of areas covered by water at various water depths as measured by existing recording gauges. We proposed to conduct field data collection primarily from March through June 2007. 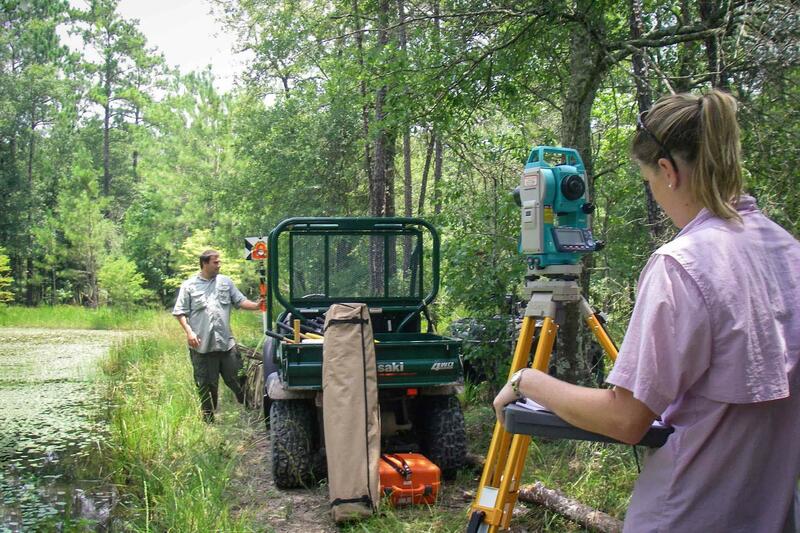 Ground elevation and water depths were to be determined by a combination of high resolution survey grade GPS and standard surveying equipment at various locations to determine the spatial extent of wetland areas. These surveys were to be compared to concurrently measured water levels that are currently collected as part of the ongoing monitoring at the site. In addition, we would install additional simple staff gauges as needed. A secondary objective was to acquire digital images with a Ricoh Caplio G3 GPS camera. This camera is equipped with a GPS receiver and automatically tags the image with a latitude and longitude. These additional enhanced topographic data will increase the accuracy and resolution of subsequent hydrologic and site analyses. A third objective was to enter all ground elevation measurements taken at various locations throughout Subdivision A Phase 1, into a geo-database. This database was to include the geographic locations of all surveyed transects as well as additional topographic/elevation. Associated pictures taken with the GPS camera would also be input into the geodatabase. These digital images would be downloaded into a GIS shapefile which allows the end user to plot where and when the images were taken. A visual demonstration of their physical locations as well as scrollable icon hyperlinked to the image was to be provided within the geo-database.